Greetings! I am Metatron, Lord of Light! I embrace each of you in Light, in love. I know each one of you, far more than you may realize. And we savor these moments we share. Dear Humans, the Universe, the Cosmos is perfection itself, regardless of any interpretation or perception of it. In a quantum sense, all things in the crystalline unified field act precisely, perfectly according to their nature, their architectural integrity. Yet some are created at higher frequencies, at higher vibratory resonance than others. And so with these words, we begin this most interesting discussion. According to one modern Mayan Calendar interpreter, we are experiencing an acceleration of consciousness like no other. In fact, the researcher says that the rate of consciousness will speed up by a factor of 20 . If this is so, what does it mean exactly? The potential for increased consciousness is indeed taking place as a pre-set quickening of the Ascension. However, the 'rate' of shift varies with each individual, and as such a fixed factor of the acceleration cannot truly be given per se. Before we comment further on the acceleration of consciousness, we wish you to know that the remarkable calendar that you currently refer to as 'Mayan', was not developed nor originally written by the Mayans in the manner that you suppose. It predated the Mayans by more than 18,000 years. It was originally developed by the enlightened Atlanteans of Poseida with assistance from the Sirian/Pleiadean Alliance, and stored by means of crystalline technology, termed 'the Crystal Skulls'. Even your more creative anthropologist considers that the earliest Mayan society only began around 2,000 BC. We assure you the calendar was in place and effect, in a much more expansive format, long before the Mayan society came into existence. What you now refer to as the Mayan calendar is but a small remnant of what pre-existed the Mayans. The area inhabited by the predecessors of the Mayans in the Yucatan area of Mexico and Guatemala was connected by a land bridge to the Atlantean island of Poseida before the quakes and the final deluge of Atlantis submerged it. Highly technically advanced cultures from Atlantis inhabited Central America and Egypt long before the final demise of Atlantis. The Central American, South America (OG) and Egyptian colonies and cultures emerged from and were one with the highly spiritual Atlanteans of the 'Law of One' for many millennia before the destruction of Atlantis. These societies contained within them an élite and highly advanced group of what might be termed 'scientist/ priests'. These sages of the Atla-Ra were highly adept at the science of mind over matter. These Masters operated through mental physics and operated in full consciousness in countless subtle degrees of multidimensionality. So while the untrained masses of humanity in the era of Atlantis lacked such skills, and indeed utilized land bridges and other less advanced forms of transport to and from the colonies of Atlantis, Og, Yucatan and Egypt, the inner circle of scientist/priests had the means to etherically bi-locate and physically manifest - not just on Earth, but also universally and galactically. They interacted with the extraterrestrials of the Pleiadean/Sirian Alliance, and were the original source of the cyclic calendar you presently term 'Mayan'. Small enclaves of these scientist/priests flourished for millennia after the deluge, and retained the knowledge of the calendar as well as the supervision of the construction of the various pyramids, with assistance from the afore-mentioned extraterrestrials. Yet these scientist/priests did not represent the society of the Mayans as a whole. That is why the Mayans are an enigma to you today. Some of the accomplishments attributed to them reveal great technical advancement, and yet the society as a whole was vastly campestral and given to unseemly ceremonies involving human sacrifice and other aberrations under ruthless misaligned dictatorships. So it follows that the scientist/priests of OG, Yucatan, Egypt and other 'forgotten' cultures before and after them, understood both the science of mental physics and had knowledge of astronomy and dimensional cycles. Only those of adept and austere initiate traditions and societies knew this, although very little evidence of any significance remains today, and what does remain is not recognized nor is as yet truly understood. The 'Mayan' priests did indeed re-write & interpret the pre existing calendars (to a certain degree) in order to make them more applicable, more understandable for the society of their era. Thus the symbolgy in the surviving calendars, you see? But again, the highly advanced inner circle of 'Maya' savants were not representative of the society as a whole. These were indeed masters, who played the primary role in the establishment of the Meso-American Pyramids and Observatories. These were beings who mastered 'mental physics'. Understanding the science of mental physics and having the ability to utilize such knowledge is what defines the gap between what today's academics know and what the advanced societies of the past knew. The influence of precise thought upon matter is not yet understood by humanity, and is a forgotten science. The scientist priests knew well the art of dematerialization and re-manifestation. It was by means of travel through bi-location, and of the translation of physical matter from location to location that the greatest of the pyramids were constructed. This technology remains a mystery to you today. The Atla-Ra and their descendants had the ability mentally to shift matter from the 3rd dimension into fields of what might be termed anti-gravity; to dematerialize and re-form and re-manifest as substance without density. In certain circumstances they were even able to alter their own reality and dimension. The significance of this is that neither the masses of the Olmec, Aztec, Mayan, nor the Meso-American peoples retained the mastery that certain aspects of their culture exhibited. Our point is that the Atla-Ra developed the calendar, and segments of the Mayans retained that knowledge and recreated records and texts to preserve it. But just as in Atlantis, the scientist/priests, while highly respected, were not the governing body nor the decision-makers as to how the society as a whole developed. Question: Is this the reason why the changes seem to be happening not only faster and faster but with more intensity? It is the increase in resonance that is escalating the potential of each individual to shift upward into great and greater conscious awareness. The Ascension is underpinned and indeed defined by the dimensional expansion of the Earth, including the crystalline realms. 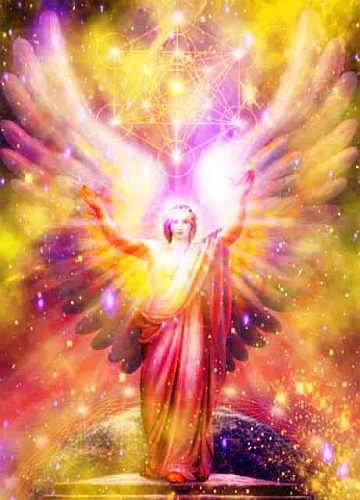 The Ascension is characterized by the 'new' input of life-force consciousness units, termed by your ancients as 'Akash' or 'Adamantine Essence' that are in themselves the potent light particulate of reality manifestation. (In our terms - Consciousness Units.) The crystalline realm begins at the level of the fifth dimension and extends to the 15th in terms of the Omni-Earth. What has been available to mankind prior to the dimensional expansion of the Ascension, has been a transduced or 'stepped-down' version of Consciousness Units in what would be termed electromagnetic energy units that are able to function in the physical polarity field and linear space/time aspects of the third dimension. Crystalline consciousness units operate in a much more rapid frequency, and are spurred into creative manifestation of reality through the higher aspect of mind, in the realm you refer to as the subconscious. Accordingly the intensity of energies, of consciousness shift and quickening of time pulse are all attributes of the resonance. The event you refer to as 'the Ascension' is in truth the expanded ability of 3D humanity to rise into a 'higher' dimension, the crystalline dimension, that has for many millennia been unavailable to you. Yet having the expansion of energies that make Ascension available, does not mean that each individual will immediately utilise the opportunity again being offered. Indeed the choice to do so remains with each person. Ascension is thus a personal option, depending on the readiness, the pure intent and indeed the Light quotient of the individual. Ascension occurs one heart, one mind at a time. It was ever thus. Earth is a free will, free choice environment by design. 'Ascension' is not a magical star-dust that immediately transmutes all that it touches - rather it is a newly-opened frequencial doorway that the individual may choose to pass through when ready. It is important to bear in mind that the Mayan Calendar, while accurate in its determination of cycles, can be analyzed differently according to the perspective, stance and Light quotient of each interpreter. Accordingly, it is more accurate to say that the degree of 'shift' or greater consciousness is determined by the awareness of the individual, and not by any pre-set numerical factor. We must add that certain 'Mayan' texts that were destroyed by the Spanish priests provided information that would have given far more expansive views of the calendar. Also, many centuries before the Maya, other texts that were vital components of the calendar were lost - a loss that has severely impaired a broader understanding of the information originally presented. Permit us to stress once again that the rate of an individual's Ascension is determined by and actuated by his intent, and his ability to rise into and absorb the enhanced energy available. Question: Could you talk about this aspect of acceleration and what it offers humanity ? Dimensional reality on Earth is programmed to appear in a time sequence you perceive as linear. It is, to use your computer terminology, a program facilitated by a server, which in this case is the 144-Crystalline grid. Through the 144-Grid the sub-programs of 'time' are inserted as holographic realities. There are epochs and eras, entire civilizations that are inserted into the Grid Server as programs. That is why certain civilizations such as the Mayan can seem to have suddenly sprung up out of nowhere into the vast 'sea of Creation' within the flow of the collective unconsciousness, the consciousness grid that enables created realities. Linear time is a functional, purposeful illusion. In truth, all programs are running simultaneously. Therefore on the level of the oversoul, you are experiencing many civilizations, and all lifetimes at the same time in the Unified Field of the Crystalline Multiverse. One aspect of the Ascension is the centering of all time, and in the greater overview, the time acceleration now being experienced on Earth is occurring because an aperture in the hologram programs of simultaneous time is allowing all holograms to complete themselves in this cycle. As such, that which you term 'Light' is itself accelerating, and this is affecting every aspect of your present experience. Question: How does it affect time, and will time itself disappear? We have said that time as you know it, is accelerating. Time and space are different aspects of the same energy. Both are aspects of Light, and the speed of Light around Earth is accelerating. Indeed, your planet is reformulating. But remember, it is not merely the pulse-flash of time sequencing that is increasing, indeed, it is humanity that is increasing in vibration. As we have said, the world remakes itself now as the inertia of time-chronology speeds past more quickly today than it did yesterday. Accordingly 2012 will continue to expedite Light acceleration and your expanding consciousness. But be clear Time will not disappear, nor will the 3rd dimension. Time is quickening within the expanded dimensionality of that termed the Crystalline Shift. With this acceleration , your life itself will shift into a higher tempo. You see, the speed of Light has increased. It is already evident to many of you that all is quickening, time is accelerating as the Ascension draws nigh. Your moments, hours and days flash by much quicker. So as time reshapes itself it will also reshape the experience of mankind, of visible and invisible forces of Nature and that of the face of the Earth itself. You must understand that each dimension above the 3rd, beginning at the 5th, has its own unique laws of physics and its own time pulse. Light becomes crystalline coherent light at the level of the fifth dimension, (thru the 12th) and increases in velocity and frequency in each successive higher dimension. And time itself eventually disappears, above the 12d, but not in 3d you see. At the time of the Ascension, when Earth and her inhabitants enter the new Crystalline era, the major power crystals will not be taken from you and misused, as occurred long ago, precipitating the demise of Atlantis. Never again will they be used for any purpose other than the highest good. Be assured of this. It is a sacred oath that will indeed be kept. And the Gathering in Arkansas on the Ascension of December 12, will be a factor in this commitment and oath. Question: Are the Pyramids symbols of the Cosmos? 'Gateways' would be a more accurate term. In a manner of speaking the Pyramids were tools for opening portals into higher dimensions, both vertically and horizontally, inwardly and outwardly. The Mayan Pyramids were constructs of the Sirian/Pleiadean Alliance. They were, formulated, engineered and manifested by means of mental mastery of physical matter. They were specifically fashioned in order to create a network of multidimensional energies and frequencies that served many purposes. One was the specific alignment of certain pyramids with specific latitudinal and longitudinal alignments, in order to create a 'field of resonance' for the planet. Question: Why did so few people understand this calendar? The Christians missionaries, for example, considered these stories to be metaphors for different categories of hell. The interpretations of the Spanish Christian priests were limited by their preconceived notion of the Mayans as infidels and pagans, beyond the pale of their own narrow Christian doctrines and fear-based indoctrination and programming. Question: I understand that only the first part of the calendar has been discovered; the second is still hidden, or lost. If this is so, what is there still to discover? Written portions of the original Atla-Ra calendar, which became known as 'the Mayan calendar', were lost, not only because of the depredations of time, but were further dissipated by various interpretations, since it was first brought into the lands of the Yucatan. The full information is still retained within the 13th Crystal Skull, known as 'Max'. There are Halls of Records yet to be found that contain vast stores of information, including world histories. Although Edgar spoke of these as being in three separate locations, and predicted that they would be revealed prior to the new millennium, they have still not yet been discovered. The comprehensive records of Atlantis are contained in holographic data recorded within 'Max'. Yet the retrieval technology of this data is not yet available to you. In the future you will develop crystalline receivers that are capable of playing back in 3-dimensional holograms the data therein, but this advance lies some way ahead. Just as you now store information in computers through digital files, and no longer transcribe lengthy text on paper, the Atlantean historians stored such information using crystal technology. Max is of Pleiadean and Arcturan construct and origin. He is a vast consciousness, akin to a super computer, with a huge library of data contained therein. He is the most powerful, most conscious of all of the remaining ancient crystal skulls. Within Max are the complete records of not only the original Mayan calendar, but the complete history of the Earth and of humanity - and beyond. The original crystal skulls came from another world, another reality. They are the prototype of perfect human consciousness, the perfection of the human being, encompassing all his aspects and potentialities. That was their prime purpose, and why they were brought here. Originally the crystalline skulls were brought to Earth from Arcturus and the Pleiades, and to the land that became LeMuria, but the original model arrived before the planet was fully in polarity. It was brought into the planet at the time of the Firmament you see, in a zero point Earth, a non-magnetic plane we will say. In an Earthen World that knew perfection, that was inhabited by an androgynous manifestation of Etheric Spirit in full consciousness. Yet even then it was already known that the Firmament would fall, would dissolve, and the plan then was that this model, this extraordinary holographic record, the original crystal skull, would serve as the prototype of this initial integral aspect. And so it contains within it the model of the 12 strands of DNA, the fully-conscious mind and being of the evolved human. The crystal skulls contain within them all that you were before the human experiment, and all that you will be when you complete it, the infinity circle. They were manifested into form above and beyond physicality, and have been brought into physicality at various times. As such, no true age can be assigned to them, because they have appeared, disappeared and reappeared many times in the millions of years of Earth's habitation by mankind. Max is not of the Earth. His origin is the Pleiades, but his construction was more of the Arcturian Crystal Masters. Question: Obviously the Mayans knew that their own society would decline and disappear. How did they protect their knowledge, and where did they go when their civilization started to dissolve? As already stated, the full records are available in the 13th, via Max. Max is an extraterrestrial Crystal Skull, a vast conscious crystal computer, and was/is the 'living data archive' used for storage of the complete information of the calendar. There are other such libraries, but Max is the only one on the Earth plane at present in the 'cranium format'. The crystal skulls contain within them that which you were before the human experiment, and what you will be when you complete it - the infinity circle. The Atlanteans worked with the original crystals skulls, the most important of which, the 13th, contains the full energy of the other 12, and was safe - guarded by the High Priest of the Mayans. The 13th skull not only gave access to the higher dimensions, it was an incomparable source of information and data relevant to the Mayans, as it contained information regarding the complete calendar, the complete map of the Cosmos as related to Sirius, Orion, Pleiades, Arcturus and beyond. It also contained the Laws of Physics for each dimension, and the cyclic codes. This conscious recorder, the crystalline cranium, is an immense databank and an invaluable tool. Certain High Priests of the Mayans, with Sirian assistance, maintained the knowledge of how to 'read' it. It existed for them in a dimension that may be termed semi-physical, and was manifested through theta level thought. Within this crystalline, conscious computer, Max, are the codes for the reprogramming of the Earth. That is why it is in a manifested form in the present time. The crystalline skull was solidified and programmed in a most complex manner. It is imbued with the divine aspect of the soul when it enters the Earth-Plane from the unified field. In a manner of speaking it is the pattern recorded into the God Self, the Subconscious or super subconscious of the human mind. The perfected man, not the version of what Man would later become in the downward spiral of human experience, but rather as the original model to which Man aspires, and gradually returns to his original, flawless archetype. Max is one of two skulls that are truly extraterrestrial in origin. The other is 'Sha Na Ra'. Both originate from the moon of an enormous planet, some twenty times the size of Jupiter, circulating Arcturus, the orange star of creativity. Hence the interest that surrounds the skulls is rapidly increasing with the coming of the Ascension, and mankind's desire to better understand himself, and to reject whatever no longer serves humankind. Systems that no longer work in both macro and micro are collapsing, and will reform themselves. To put it another way, mankind is rebooting, just as is the Earth herself. The knowledge of the universal Mind exists above and beyond the Crystal Skull; yet the universal Mind is encompassed and zipped within it, in a way that benefits mankind. The knowledge within it is available for human access. The Ascension is, in geo-mathematical terms, occurring in base 12. The Atlanteans utilized base 12, as well as other mathematical bases depending on the dimensional application. It is perhaps more accurate to say that the Crystalline transition, which is the core essence of the Ascension, is occurring in 12 waves, from the 01-01-01 through the 12-12-12, base 12 you see. The expansive earth of the Ascension has 12 dimensions. 144-Crystalline Grid is activating in 12 stages through the phenomena of the 12 triple date portals. Both then utilizing the base 12. The base-12 , twelve- wave scenario is frequencially appropriate to the resonance of the Ascension. There are 12 major 'Sun-Disc' on the planet, Each of the 12 carry specific purpose and are receiving new crystalline codes. Each of the 12 primary apparatuses feed 12 satellites...the 12 connecting to the 144 in a complex geo symmetry that is suited to the base 12 of the Earth and indeed also is the Crystalline 144-Grid formulated in base-12 mathematics. The Mayan's had vigesimal numerical system, which used base 20. Unity consciousness is indeed a noble aspiration, and is very appropriate, but it is not truly specific to or limited to the dates chosen in the ninth wave initiative. The conscious divine energy behind what you term the Mayan Calendar is independent of and vastly predates the Maya. It is in its core a potent living energy field that is by no means dependent on what is contained in the calendar or interpreted from the remnants of the calendar. It is far more than what you imagine it to be. It is dynamic and ever expanding. While it is the source energy that allowed the calendar to be composed, that very composition is merely one aspect of this dynamic gestalt. Question: Were the Atlantean Law of One Crystals stored in Arkansas and Brazil a major part of the technology of Atlantis? A major part of everything, especially the high level of spirituality with the Law of One. But it is important to note that spirituality took precedence in their application during the Golden Era. The technological applications were then applied through a spiritual entreaty of non-linear mental physics with the use of crystals in what may be termed the 'sacred sciences'. The crystals were viewed as living entities and were not used in any untoward manner, only for betterment within highest good. You see, before Atlantis was taken over by the Aryans in its final destructive stage, a beautiful, peaceful and highly spiritual matriarchal society called the 'Law of One' presided in extraordinary harmony for over 20,000 years in what is termed the 'Golden Age of Atlantis'. The era of the Law of One in the incredibly harmonic Golden-Age of Poseida achieved the highest frequency of Love ever actualized on planet Earth. The crystals were a key part of the energy that allowed for their harmonic society and enlightenment. They are now re-emerging. At the time of the Ascension, when Earth and her inhabitants enter the new Crystalline era, the major power crystals will not be taken from you and misused, as occurred long ago through the Aryan deception, precipitating the demise of the Law of One Golden era of Atlantis. Never again will the Crystals be used for any purpose other than the highest good. Be assured of this. It is a sacred oath of the 'Law of One' that will indeed be kept. The Law of One then is re-emerging in spiritual grace within the crystals of Arkansas and Brazil. • Archangel Metatron: The Art of Creative Living – Believe It or NOT ! • Archangel Metatron: Where is the Love? • Archangel Metatron: 2013 - The Extraordinary 2nd Half of Year One! • Archangel Metatron: Ascension; What Does It Entail? • Archangel Metatron: 2013 - Year One of the New Earth "The Magnificent Beginning"